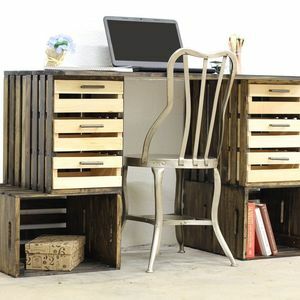 Using Crates & Pallet Large and Small Wooden Crates from The Home Depot and finished with a piece of plywood or wood of your choice, this Crate Desk is a fun conversation piece for an office, craft room, or dorm room, at a very reasonable price! 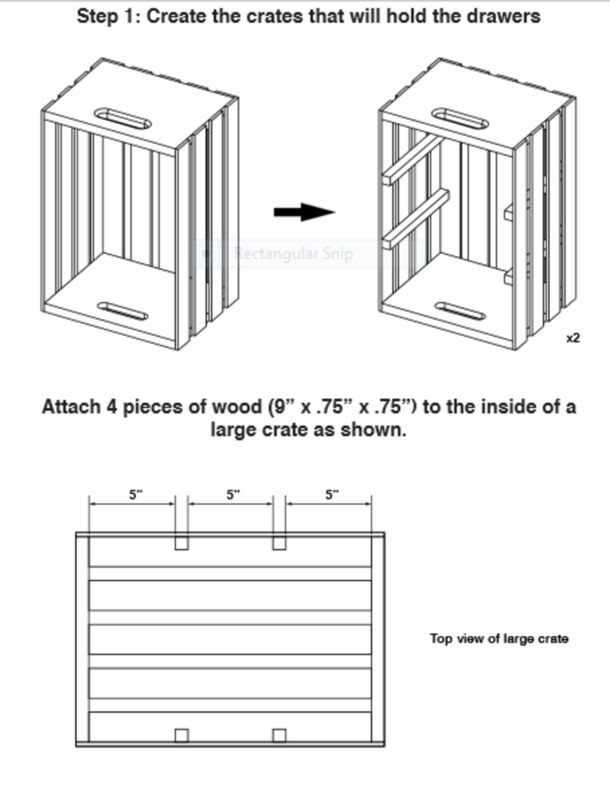 (4) PIECES OF CUT WOOD 18.5" X 1.75" X 0.75"
With the crate handle side towards the ground (crate is vertical), attach 4 pieces of wood (9” x 0.75” x 0.75”) to the slatted inside of one of the Large Crates using 1" wood screws. 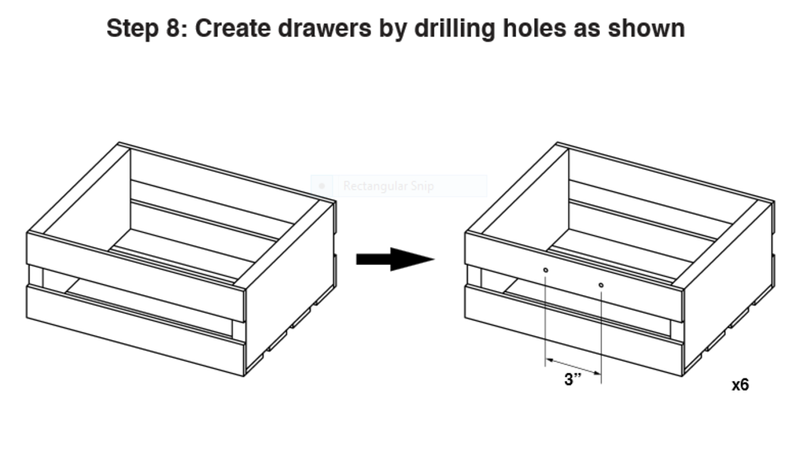 Use two screws per each piece of 9” x 0.75” x 0.75” wood. 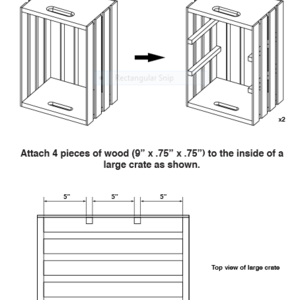 Screw the other 4 pieces of wood (9” x 0.75” x 0.75”) into the slatted inside of a second Large Crate. 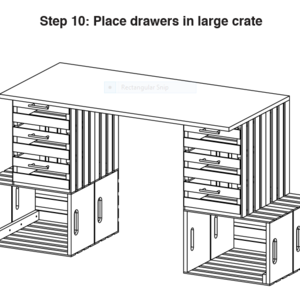 Set these two Step 1 Large Crates aside. See attached image for placement and spacing. 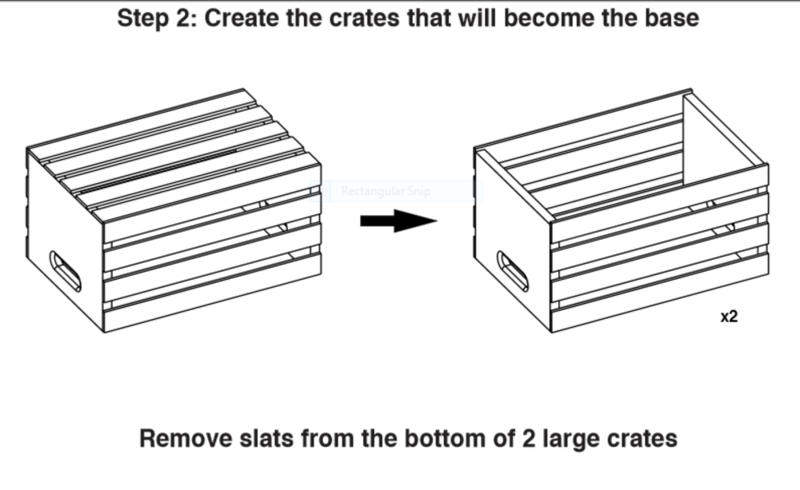 Remove all slats from the bottom of 2 more of the large crates. 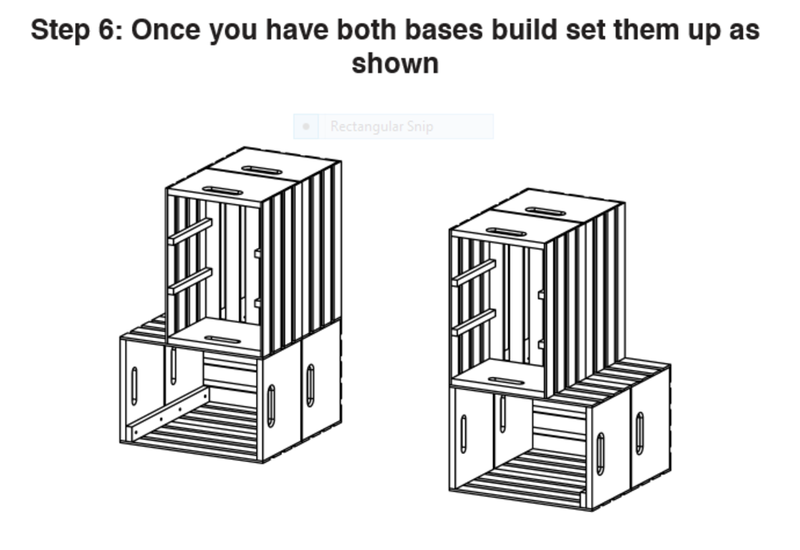 Create front half of the Crate Base. 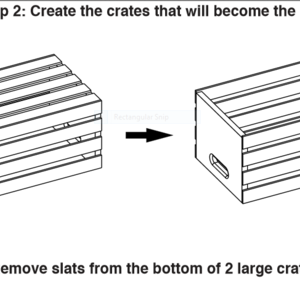 Attach one of the vertical Large Crates from Step 1 on top of and aligned to the far right of one of the Large Crates with bottom slats removed from Step 2 making sure that the Step 2 Large Crate with bottom slats removed is horizontal while the Step 1 Large Crate is vertical on top. 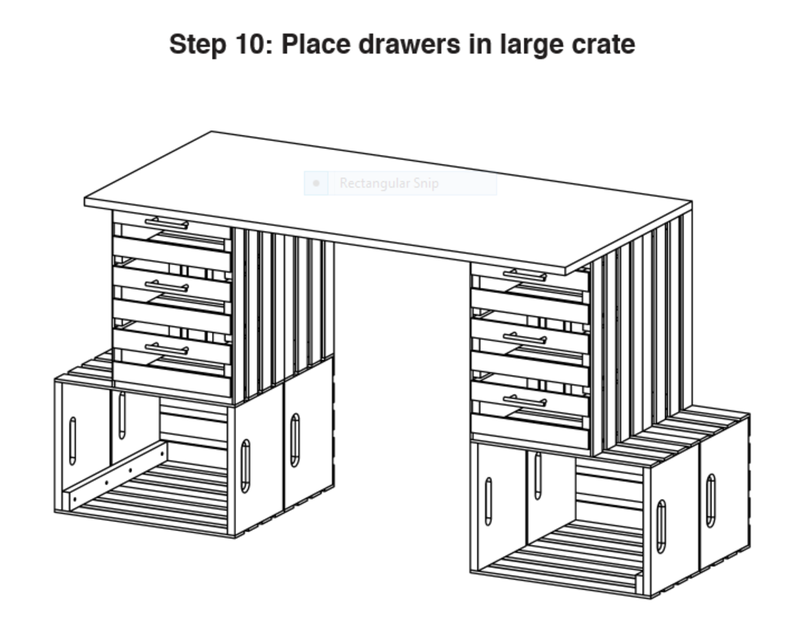 Use (4) 1" wood screws in each of the four corners to attach the two crates together. 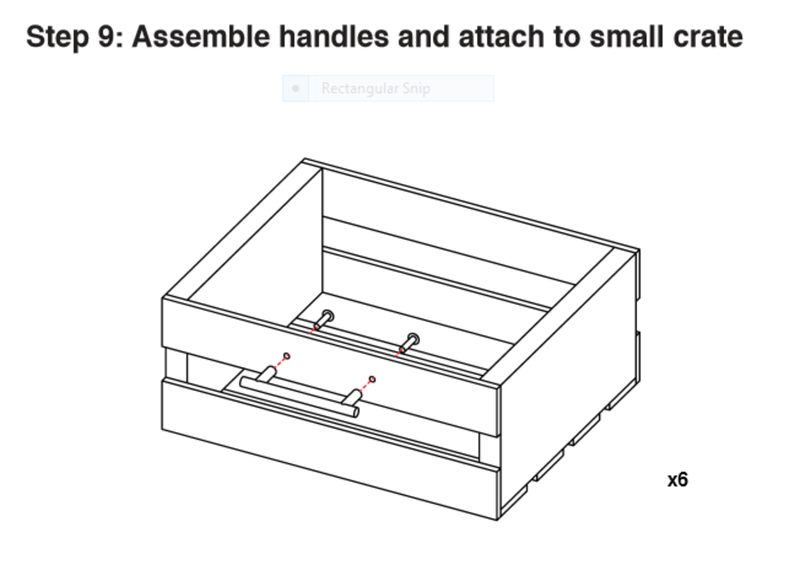 Attach the other vertical Large Crate from Step 1 on top of and aligned to the far left of the second Large Crate with bottom slats removed from Step 2 making sure that the Step 2 Large Crate with bottom slats removed is horizontal while the Step 1 Large Crate is vertical on top. 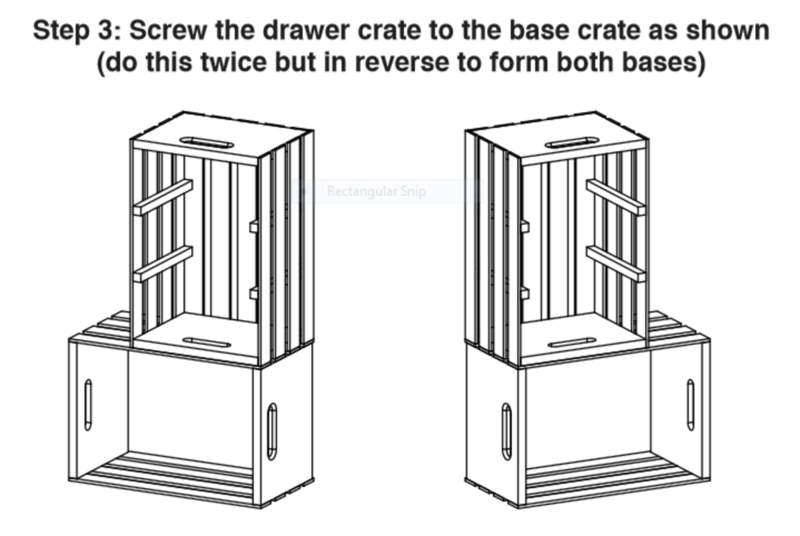 Use (4) 1" wood screws in each of the four corners to attach the two crates together. Set the front half of the Crate Base aside. See attached image. 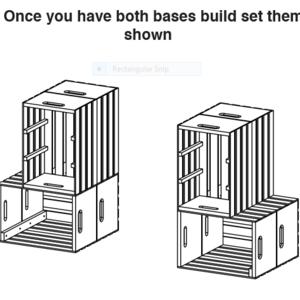 Create back half of the Crate Base. 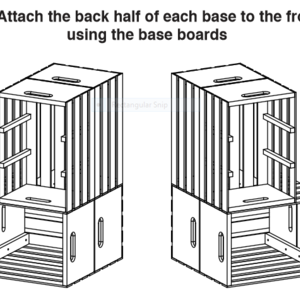 Attach another Large Crate vertically on top of and aligned to the far right of another Large Crate that is resting horizontally. 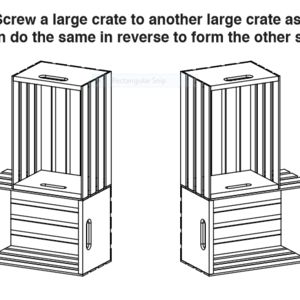 Use (4) 1" wood screws in each of the four corners to attach the two crates together. 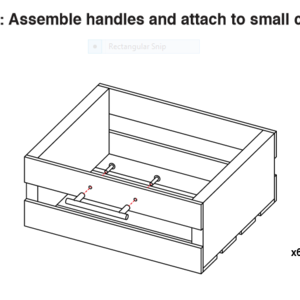 Repeat with an additional vertical Large Crate attached on top of and aligned to the far left of another Large Crate that is resting horizontally. 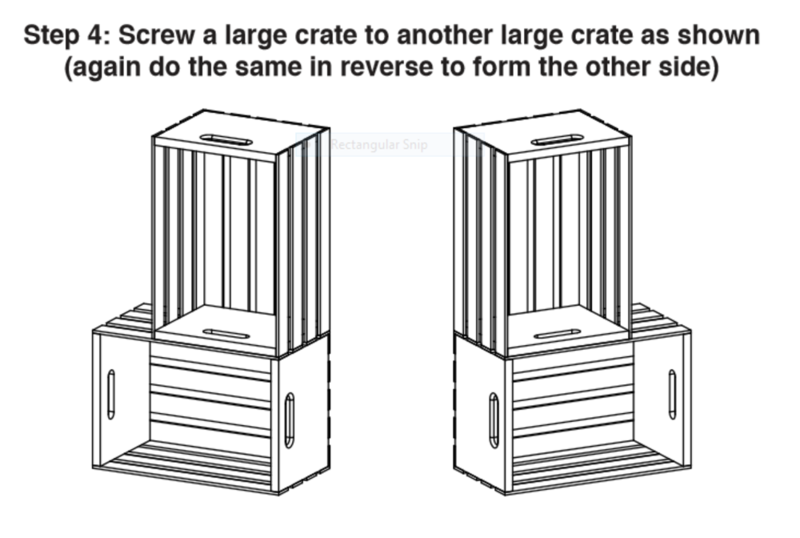 Use (4) 1" wood screws in each of the four corners to attach the two crates together. See attached image. Line up the two far right aligned crate bases making sure the front half Crate Base from Step 3 is open and outward facing, and the back half of the Crate Base from Step 4 has the slatted side facing outward on the back side. 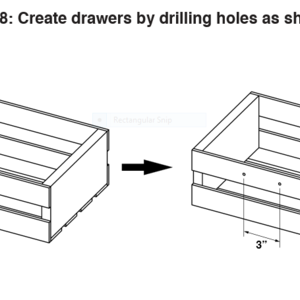 Using the wood cuts (18.5" x 1.75" x 0.75"), attach the two base halves together along the inside of the bottom two horizontal crates with (4) 1" wood screws screwed into each of the two pieces of wood. Line up the two far left aligned crate bases making sure the front half Crate Base from Step 3 is open and outward facing, and the back half of the Crate Base from Step 4 has the slatted side facing outward on the back side. 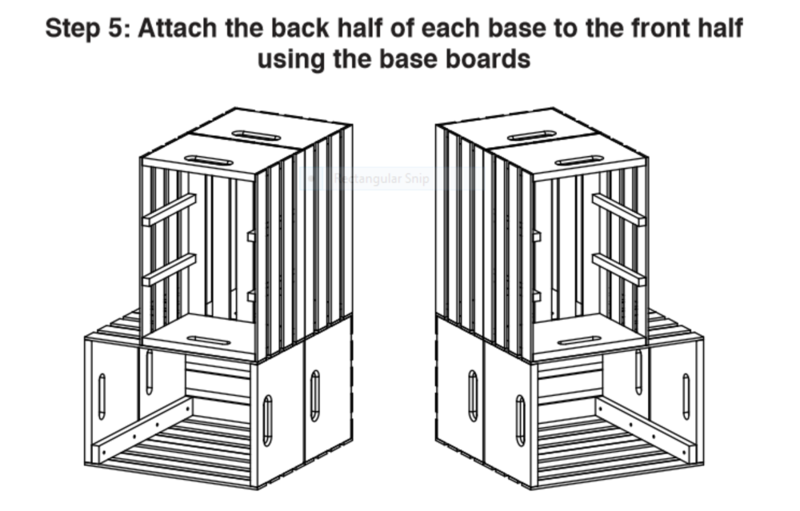 Using the wood cuts (18.5" x 1.75" x 0.75"), attach the two base halves together along the inside of the bottom two horizontal crates with (4) 1" wood screws screwed into each of the two pieces of wood. See attached image. Align and space the set of Crate Bases about 4' apart. See attached image. 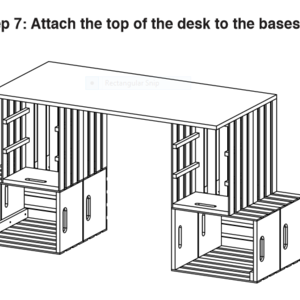 Attach the 2'x 4' piece of plywood or other wood species (or whatever other material of your choice) to the top of the two Crate Bases to form the top of the desk. 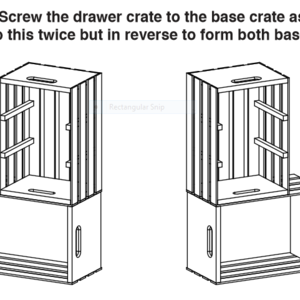 Use (4) 1" wood screws along each 2' side of the desktop board to secure into the Crate Bases. 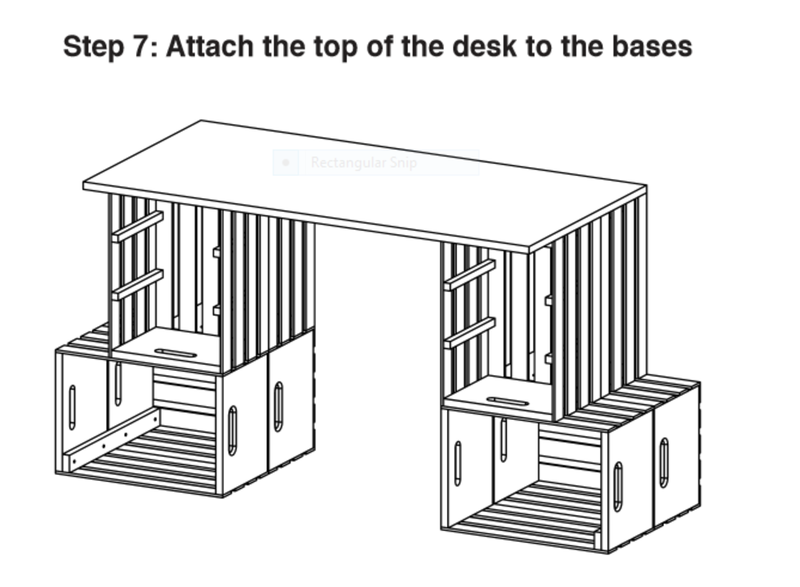 Set crate bases with attached desk top aside. See attached image. 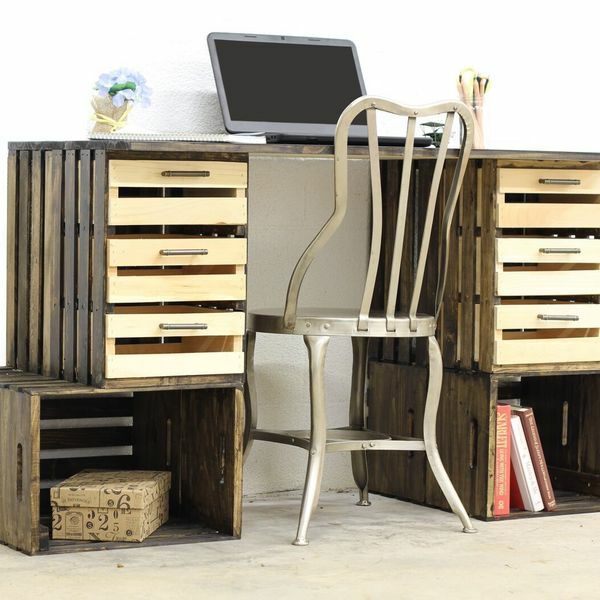 Nice work, did you build your own crates? Or you find these somewhere?